Last week, I had some more time on my hands for sewing. I still dedicated most of it to sewing shirts for certain men in my life ;)My boyfriend has a new job which means he isn't wearing overalls all day anymore. And he happens to be addicted to the comfort and fit of my made-to-measure shirt block... In the past month or so, I've made him no less than three new shirts.The other man benefitting from my shirt making skills is my younger brother. It's his 22nd birthday next week and he loves the two I've made for him before. For myself, I made the bag (see below) and played around with refashioning an old jumper of E's. 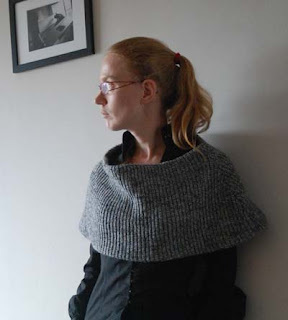 I made the cardigan in last weeks outfit and this cowl-thing out of one. This flappy-collared vest was made from the second jumper. - Use a basic fitted t-shirt pattern as shape to start with. I used mine for both cardigans. It will give you a proper shoulder- and neckline and a proper sleeve (even if you don't use the side shaping, like I did in the last one). When using a thick knit, cut 1 cm wider than you would for jersey. Once you have your basic body-bit, improvise from there. - I'm afraid you need a serger for knits like this. And take care with the settings. I tested them before I started sewing and ended up with the differential quite high to avoid pulling the fabric out too much. - If you want to make a nicely finished, invisible hem, first serge the edges, then fold them in and stitch them down by hand. The last thing is something I started on in the weekend and finished yesterday. Leather trousers. I bought a pair which I knew to be too large for me at my usual thrift stall a few months ago (for just 5 euros). I had to build up courage and come up with a plan to make them smaller. Eventually, I manage to get away with just taking in the side seams (although that meant taking out and re-attaching most of the lining). It's a new look for me and I have to get used to it, but these will be great in cold weather. You are very clever, the renovated knits look fantastic. Well done!